This April Fools’ Day, wildlife circle in Karnataka was taken for an African ride with a number of social media groups sharing a fake picture of wildlife and appreciating it. 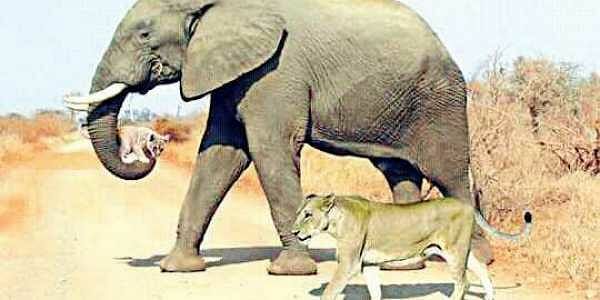 HUBBALLI: This April Fools’ Day, wildlife circle in Karnataka was taken for an African ride with a number of social media groups sharing a fake picture of wildlife and appreciating it.The wildlife circle was baffled to see a picture of an elephant carrying a lion cub in its trunk and the ‘tired’ mother lion walking beside it! Many wildlife groups in Karnataka went abuzz with the picture. Many who woke up to see the “great natural history moment” running in Africa started sharing the tweet and the picture on social media forums. Some wildlife photographers even shared the photo on social media handled by Sanctuary Asia and this made many believe it could be a real image. Many people even “analysed the event”. Some said the nature sees many wonders happen. Others said humans must learn from animals to co-exist. But the wonder of wildlife died down after websites from Africa termed the photo fake and it was an April Fools’ Day prank. The SA People News stated, “Alarmingly, it appears that thousands of those actually thought the photo was real. Some suggested a movie should be made based on the scene and others remarked how amazing nature is. Of course it was none of the above. Just basic photoshopping skills on April Fool’s Day,” the webpage read. Indrajit Ghorpade, senior wildlife conservationist and photographer said there have been instances in the wild where predators have shown “human face” during conflicts.“But the photo that was circulated on April 1 certainly cannot be true. We see conflicts between tigers and elephants in India and lions and elephants in Africa... In Africa after hunting down a baboon, the female leopard had taken care of the baby,” he explained.